Two BISC members won titles and another won a silver medal at the British Solo Ice Dance Championships on July 24 and 25. And a further two just missed out on medals but came a very creditable fourth in higher classes than they competed in last year. In fact all 12 club members who competed in the championships at the national centre in Sheffield should feel proud of their achievements because, according to judges, the overall standard was the best ever. Once again the novice and primary events were held on the Saturday with the junior, intermediate and senior sections on the Sunday. Hayley Salmon, aged 8 and believed to be the youngest competitor in the event, continued the progress she had made throughout the season by skating a superb 14 Step in the novice championship compulsory dance section which put her in sixth place out of 18. It gave her the psychological advantage of skating in the top group in the free dance, where she again skated well, but her lack of experience took its toll and she came 13th in that section. It meant she finished 12th overall - no disgrace for someone so young and in their first championship season. “It was an amazing result and she thoroughly deserved it,” said David Phillips who coaches her with his wife Lucine Chakmakjian. Sadie Robbins, 9, also had a good skate to come 12th in the compulsory but her 17th place in the free dance dropped her to 16th overall. Rebecca Forsyth, 13, who last year won silver in the novice event, has now moved up to primary level where she did extremely well to come third in the Willow Waltz compulsory dance and fifth in the free dance which gave her a final placing of fourth out of 18. Claire Miller, 13, moved up from 10th last year to sixth, and Fiona Piggott, 13, moved up from 13th to eighth while Charlotte Hester, 12, competing in her first dance championship (having skated with David Truby in the novice pairs free skating championship earlier this year) came 11th. Helen Ingram, 14, who last year came fourth in the primary championship and had to move up to juniors this year because of a change in the age limit, put in an outstanding performance in the junior girls’ section where she came fifth in the blues compulsory dance and fourth in the free dance which gave her fourth place overall out of 17. Unfortunately Tamsyn Pack, 14, who last year came 7th in the junior championship and was predicted to win a medal this year, had to withdraw because of injury. Christopher Hockaday, 15, who won the primary boys’ title last year, this year won the junior men’s championship where he was the only entrant. Michelle Bannister, 16, who came 15th in last year’s junior championship, excelled herself by coming sixth out of 16 in the intermediate ladies’ championship while Leah Rogers, 16, came 13th in her first championship. Richard Boaden, 16, who last year won the junior men’s title, did extremely well in the intermediate men’s event – contested by six skaters - where he had an excellent skate in both the compulsory Tango and the free dance section but was narrowly beaten to the title. John Horne, 18, who has previously won all the lower solo men’s titles and is now training full-time at the Sheffield rink, added the senior gold to his collection when he competed against just one other competitor, a middle-aged man, who he completely out-skated in every way. 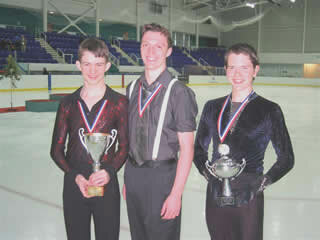 * Medallists (l-r): Christopher Hockaday, Richard Boaden and John Horne. Novice championship, girls: Hayley Salmon (6th, 13th) 12, Sadie Robbins (12th, 17th) 16th. Primary championship, girls: Rebecca Forsyth (3rd, 5th) 4th, Claire Miller (6th, 7th) 6th, Fiona Piggott (8th, 8th) 8th, Charlotte Hester (12th, 9th) 11th. men: Christopher Hockaday (1st, 1st) 1st. Intermediate championship, ladies; Michelle Bannister (5th, 7th) 6th, Leah Rogers (13th, 13th) 13th; men: Richard Boaden (2nd, 2nd) 2nd. Senior championship, men: John Horne (1st, 1st) 1st. * Former BISC member Carly Emery won bronze in the intermediate ladies’ section while Joshua Irish, who is coached at Lee Valley by former club member Joanna May, won bronze in the novice boys’ section.